Selecting new t-shirt ideas is a tricky process. 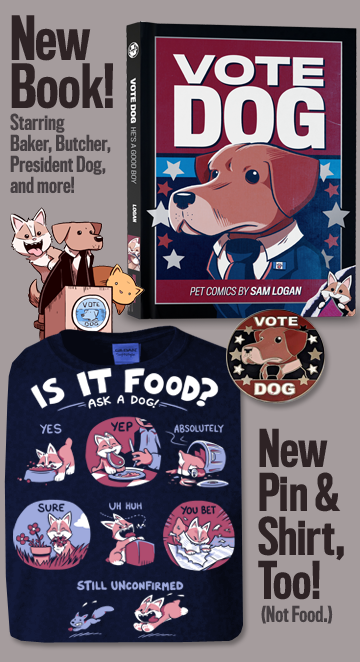 They have to be based on a joke or idea that stems from one of my comics in some way -- that's the only real rule I force myself follow -- but which strips lend themselves best to potential shirt designs? But right now, I think we are having a rare moment of alignment. Because a large number of you wrote in on Friday to tell me that you think Conscience Cat would make for a neat shirt. And this time, I think you're right! I was really happy with that strip, and I like how conscience cat's design turned out. So, I will see what I can come up with! My strip probably won't make much sense to you if you haven't read Rene's comic before... but if you haven't, you should! Just don't read it anywhere that frowns on cartoon people with crippling emotional problems and noodle-y naked bodies. Because that's two-thirds of Anders Loves Maria right there! For those who missed it the first time around and are ready for education -- Gertrude's entire history was succinctly chronicled in the Tangent storyline. Today is the last day of the much-hyped Book 2-pack sale. 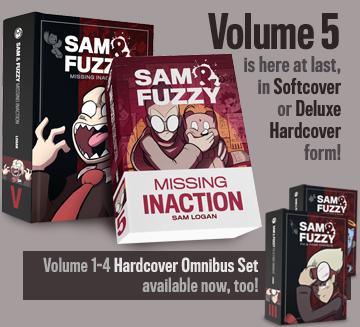 If you were hoping to pick up the first two Sam and Fuzzy books -- with or without original sketches inside -- today is the last day to do so at the discount price. You have been warned! Resume life. In other news, I had a lot of fun playing Rom Check Fail yesterday. Maybe you will too! Think of it as a mash-up remix -- only with Mario, Pacman and Asteroids instead of the Beatles, Jay-Z, and Yorgi Yorgensen. The action unfolds at a Wario-Ware-esque pace, with the player character, enemies, and environments shifting randomly between different classic games every few seconds. (But never from the same game at the same time, mind you.) If you ever needed a game to teach you that the Space Invaders laser cannon is total garbage against Goombas, this is it.